Transport Malta is concerned about people drinking and dancing on double-decker buses rented out for street parties – but does not have enough staff to stop it. 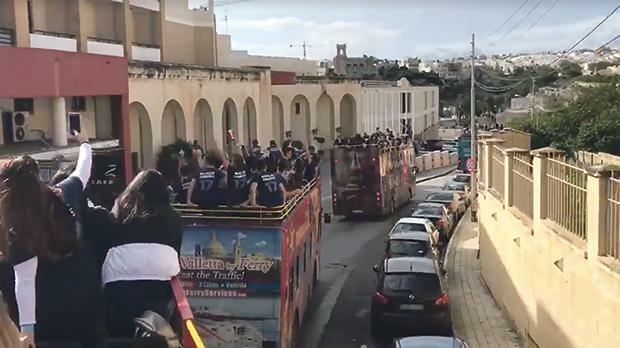 Transport Malta sources told Times of Malta that the widespread use of double-decker buses for parties and so-called ‘buscades’ were a worrying safety concern. “A lot of what happens during these buscades is illegal: people under the influence of alcohol cramming onto the top floor to dance and listen to music while a bus is moving. You can’t stand on the top floor, you can’t drink on board, and you definitely can’t have a party and dance on board a moving bus,” a source within the transport regulator said. The source was quick to add that operators knew all this, but “as always it all boils down to enforcement resources”. Sightseeing bus operators this newspaper contacted defended buscades as a legitimate use of double-deckers, but admitted that some passengers were “reckless”. One operator said that it informed those on board before setting off on a bus party that passengers were not meant to drink and dance on board. “We get a lot of requests, for instance, for hen parties or graduations. We tell the person who booked the bus that they are responsible for anyone who breaks the rules,” the operator said. He added he was aware that some passengers could behave dangerously. “We have had people get hurt because they did stupid things. If you enjoy yourself responsibly, then you will not be putting yourself in unnecessary danger,” he said. Transport Malta, meanwhile, confirmed that standing on the upper deck of a bus was “illegal and strictly prohibited”. In a reaction issued on Tuesday afternoon, the transport regulator said that it had added 100 enforcement officers to its books since 2012, bringing its total up to 167 from 67. "We understand that a number of people have experienced reckless passengers, drivers and illegal actions on our roads," a Transport Malta spokesman acknowledged. "Transport Malta is committed in its mission with other enforcement agencies, through education and enforcement, to help achieve safer roads. The recent investment in human resources, training, vehicles and other tools is testament to that," they said, adding that the general public should follow road rules and report any illegalities they came across. Safety on board double-decker buses was cast in the national spotlight last week after two tourists were killed when a sightseeing bus hit tree branches in Żurrieq. Some 50 tourists were injured in all, six critically. Hospital sources have confirmed that three patients remained in the ITU, while a fourth had been moved to another part of Mater Dei Hospital. Transport Malta drew up guidelines that recognised trees as a potential roadside hazard back in 2011 but has failed to confirm whether these guidelines ever came into effect. The removal of such obstacles could reduce fatalities, according to Transport Malta’s Technical Guidelines for the Preparation of Road Safety Audits, Road Safety Impact Assessments and Road Safety Inspections. Sightseeing bus operators told this newspaper they welcomed the introduction of guidelines, while stressing the need for a review of the road network. “We have said this time and again: the roads are like an obstacle course. Driving these buses can get nerve-racking. You’re constantly worrying about crossing electricity cables and trees,” one operator said.